Rivers have supplied power through water-mills for thousands of years; the sea is opening up to power-generation from wave-powered devices - but who'd have though that where the two meet, there exists the potential for a new type of eco-battery, powered by the mixing of fresh and salt waters. That's the promise being opened up by innovative research, on how contrasts in saltiness can be turned into a new form of renewable energy, just published in the journal Nano Letters. The ability to make a battery from something as simple as mixing freshwater and seawater comes from that sharp difference in saltiness. The dissolved salts in seawater provide positive and negative ions (sodium and chlorine) that can flow between electrodes, and so produce a charge. The critical aspect of getting such a simple setup to work in the real world, lies in using electrodes from efficient, but readily available, materials. This eco-battery works by first being filled with fresh water, and then applying a small current. This sets up a charge between the two electrodes. Then the seawater flows in - as the freshwater is being removed - and a vastly increased flow of both positive sodium ions, and negative chlorine ions, produces a discharge of electricity into the electrodes. The water cycle is then repeated. 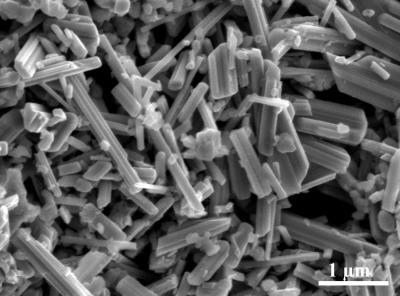 For this research the team from Stanford University, led by Yi Cui, a professor of materials science and engineering, used an anode (the positive electrode) made from tiny nano-bundles of manganese oxide. It is the nano-scale structure of this electrode, with its large surface area, that radically eases the flow of ions in and out - so raising the efficiency of the battery to nearly 75%. This approach also avoids issues with previous saline batteries, which used fragile membranes, and could only use either positive or negative ions. There however, a long way to go to scale up these devices to be practical for use in real-world estuaries. For a start, the current cathode (negative electrode) is made from expensive silver. Then there is the tricky issue of how to ensure that such devices don't damage delicate river-mouth ecosystems. Cui is optimistic this can be overcome. 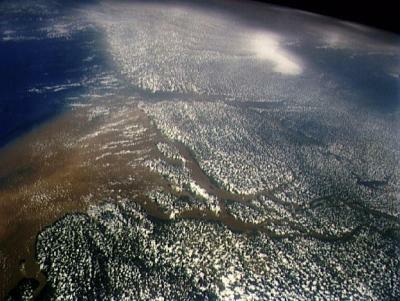 ''We don't need to disturb the whole system, we just need to route some of the river water through our system before it reaches the ocean. We are just borrowing and returning it.'' And the potential capacity for electricity generation could be huge - he estimates up to 2 terawatts of electricity could be produced each year. That could be a make them the ultimate renewable battery for the clean energy era. Image Credit: Courtesy of Yi Cui, Stanford University. 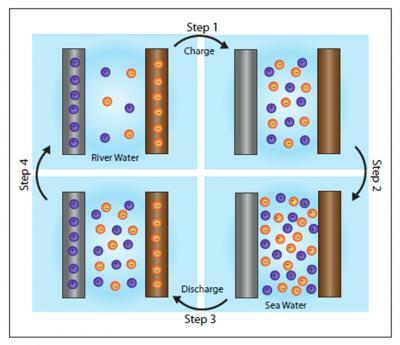 (The initial state of the battery developed by Yi Cui, with two electrodes immersed in fresh water. Purple and orange dots represent positively and negatively charged ions, respectively. In Step 1, a small electric current is applied to charge the battery, pulling ions out of the electrodes and into the water. Step 2, the fresh water is purged and replaced with seawater. Note much higher abundance of charged ions in the salt water. Step 3, electricity is drawn from the battery for use, draining the battery of its stored energy. Ions return to electrodes. Step 4, seawater is discharged and replaced with river water, for the cycle to begin anew).